& Upton Park Scratch Competition Winner 2010. Sean started playing snooker at the age of 9 years , by the time he was 10 his parents decided to get him coaching lessons from Del Smith. At this time Sean was using a b.c.e. Ronnie O'sullivan 2 pc cue, Del advised him to get a cheap 3/4 cue so he did. 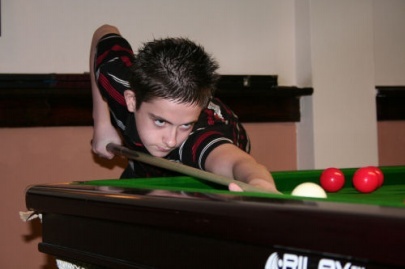 At 11 years old (2006) Sean entered the English u13 championship and made it to the last 16. 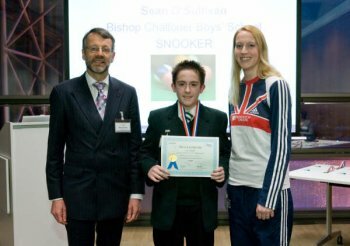 After his 12th birthday in the same year Sean entered the Essex u18 championship which he won. By 2008 sean was picked to play for England 'b' in the u14 & u16 home internationals. In September 2006 Sean entered his first Upton park handicap competition, by February 2007 he'd won his first event beating club regular Nirmal Bamotra, Sean was getting a 16 point start from Nirmal now Sean gives Nirmal a 44 point start. For his 13th birthday Sean was given a cuecraft Royal Standard cue by a manager of Mile End snooker (sister club). 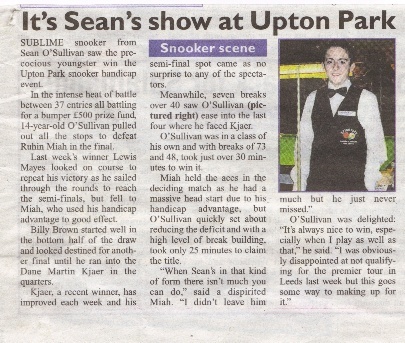 Sean has now been to the final of the Upton Park handicap competition 26 times winning it 16 times. August 2010 sean won the Upton Park Champion of Champions & the Upton Park Scratch competition. During an u16 event in Plymouth 2009 Sean made his first competition 100.
and 2 X 147 in practice frames. Sean's maximum break verse's an apponant is 142 and in tournament play is 137 clearance after his apponant potted the first red. In 2009 Sean got a J.Parris superior cue from his sponsor. This year Sean recieved a cash award from Tower hamlets for elite athletes , Sean has used this money to get a new J.Parris Ultimate cue custom designed. For the last 2 seasons Sean has played in the English Premier Junior Tour (U 21 & 6 events per season open to the top 40 amatures), Sean has qualified for the second day 5 times and lost twice in the quarter final stages. Sean won event 6 at North East Derbyshire Snooker Centre this season and he it ended in 8th place earning him a place in the england U 21 team. Now Sean is 16 he is practising full time at Upton Park and is looking to turn Pro in the next 2 or 3 seasons. Sean often has Martin Gould come down and practice with him and on the 6th of june this year Martin made a maximum 147 break on our newly re-cushioned match table , this was the first 147 to be made at the club on regulation pro size pockets.